Depending on the Observer options you choose, you may experience a video delay in Observer. This tutorial explains how to choose the correct options for your testing environment. The Connect to Recorder dialog (Connection > Connect) allows you to select Observer session options. The option you choose here will determine if you have a video delay. A slight delay is present in the Observer display. Observers see the screen and/or camera video and hear the audio. Video and audio streams are combined into a single Windows Media Stream and sent through the network. This process can take time and will always introduce some amount of delay. Observers see the screen and PiP video, but do not hear the audio. Requires less bandwidth and compression. Streams at virtually real-time speeds. Use if your testing environment demands no delays. 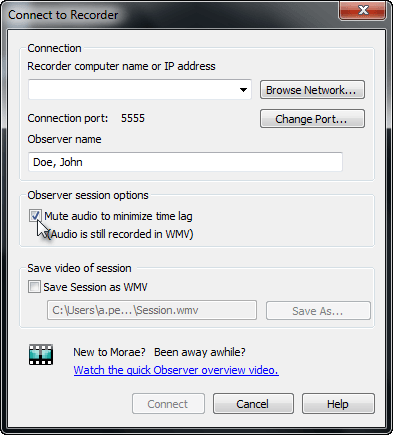 Audio is always included in the WMV file saved by Observer, whether or not you can hear it while observing a session. Is your Observer computer in the same room as the participant? Can the observer hear the participant without using the computer? Do observers need to see the participant video in real-time? Have you noticed a video delay? If you can answer Yes to the any of these questions, you will want to mute the audio.